Tour guide Andy Smith captivates crowds with his tales of Halifax’s haunted past, accompanied by a history lesson or two. Did you know that The Five Fishermen restaurant was once a morgue? That one of Halifax’s earliest murders took place on Brunswick Street? That while there are only 1,200 graves in the Old Burying Ground, there are more than 12,000 bodies buried there? 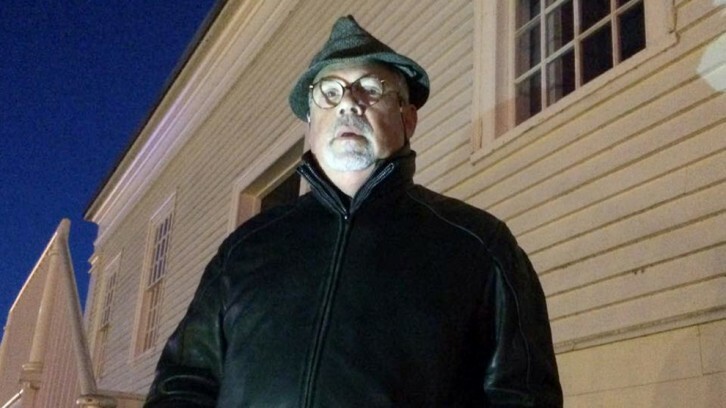 Credit Andy Smith, who owns and operates Ghost Walk of Historic Halifax, for offering a lesson about the city’s haunted history — if you’re brave enough. Though the walk is based mainly on ghost stories connected to buildings and those who used to occupy them, Smith also sprinkles in bits of history. For instance, the walk stops on Barrington Street so Smith can point out the building Anne of Green Gables author Lucy Maud Montgomery stayed at when she was a student at Dalhousie. Smith also stops at The Press Gang restaurant to explain how the phrase “press gang” was a means used by British officers to “press” drunken men into the navy in the 18th and 19th centuries. Melissa Keindel went on the walk, as she’s always been interested in the paranormal. She claims she saw a shadow of a mysterious figure in a window of The Five Fishermen while on the walk. Smith says not everyone sees something on his walk, but reactions like Keindel’s are common. “There’s a range of psychic intuition or something. Some people see things, some people feel things, some people just sort of get a premonition. It seems to be very individualized,” he said. “I used to be very, very skeptical about ghosts. Like many people, I was raised to believe that we are only able to experience or sense this life,” said Smith. Smith has a background in sales and marketing and never intended on being a “ghost tour guide,” he said. After growing bored of working for a graphic design company, he started his own business, Tattle Tours, which offers tours to places like Peggy’s Cove and Mahone Bay. After realizing how popular ghost walks were becoming around the world, Smith did extensive historical research and began offering the ghost walk 11 years ago. The walk is offered from May through Halloween, and Smith does as many as 30 walks in the month of October. Smith, 65, is originally from New York City but has lived in Halifax for 18 years. Besides working as a tour operator, he is also a professional actor and has appeared in the television series Haven, Emily of New Moon II and acted as a drunk, cross-dressing undercover cop in Trailer Park Boys: Countdown to Liquor Day. He says his love of acting is incorporated into the walk. “I try to treat the tour as a performance and tell the stories in an engaging, animated way,” he said. Smith frequently asks people on the walk if they’d like to stay behind at a supposedly haunted building while the rest of the walk continues — no one accepts. Many giggles are heard on the walk, as Smith makes several humorous jabs at those in his stories, on the tour and even himself. Emily Forrest, who also went on the walk, says Smith didn’t make her believe in the paranormal, but she was impressed by the “theatrics” of the walk, such as Smith’s enthusiasm and energy when telling stories. Though Smith wouldn’t call himself a believer in the paranormal, he says he’s had some “odd experiences” giving the tour. He says while giving the walk in the Old Burying Ground, he saw what looked like a man in a black coat walk past him then disappear into nowhere. Smith also encounters many supposed psychics who often tell him of unseen entities they feel they’ve experienced on the walk. Though the walk season will end in about two weeks and Smith isn’t getting any younger, he fully intends to start the walk back up in May for its twelfth year. “I’ll keep doing it long as I have my mind,” he said. What a great photo! excellent!! !